This is an important message for everyone that has been arrested on the 5th of July 2011, during the eviction of Schijnheilig, on the Passeerdersgracht 23-25 in Amsterdam. 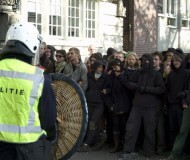 More than a year after the eviction of Schijnheilig, some of those that were arrested have now received a payment proposal, a so-called ‘transactievoorstel’. It is a letter from the Ministry of Justice with a payment slip.